Genevieve Valentine, author of “The Finest Spectacle Anywhere” in BCS #68 and “Bread and Circuses” in BCS #55, both set in her steampunk Circus Tresaulti setting, has an interview in Locus (excerpted online here) about steampunk, circuses, her Circus Tresaulti novel Mechanique, and how she got into SF/F as a young reader. Saladin Ahmed, author of “Where Virtue Lives” in BCS #15, discusses that story, another in the same world, and his debut novel Throne of the Crescent Moon, featuring characters who debuted in “Where Virtue Lives”, here at Fantasy Book Critic. Check out the interview, and his stories and novel, if you haven’t already. ...Leslianne! For her very interesting comment about Raseed as a character, in “Where Virtue Lives”. Her copy of Throne of the Crescent Moon will be in the mail soon. Thanks to all who entered the giveaway! I hope everyone enjoyed the story and enjoys the novel! In conjunction with the BCS giveaway for a copy of Saladin Ahmed’s new novel Throne of the Crescent Moon, BCS did a very short interview with Saladin, asking how the debut story featuring those characters and world, “Where Virtue Lives” in BCS #15, compares to the novel. Check out our micro-interview with Saladin, and make sure you enter the giveaway for a copy of Throne. In conjunction with the release of BCS author Saladin Ahmed’s new novel Throne of the Crescent Moon, which features characters who debuted in his story “Where Virtue Lives” in BCS #15, BCS is giving away a hardcover copy of Throne of the Crescent Moon. To enter the giveaway, reply in the comments thread for “Where Virtue Lives”, saying what character from the story, or element about the setting or anything else in the story, that you are most interested in seeing in the novel, and why. The giveaway ends Wed. Feb. 15. The full rules are here. Good luck! Enjoy (re)reading the story and the novel. BCS will be at Epic Confusion, a Detroit-area con, this weekend. Guest of Honor is fantasy novelist Patrick Rothfuss. Other attendees include BCS authors Cat Rambo (“Love, Resurrected” in BCS #65), Michael J. DeLuca “The Nine-Tailed Cat” in BCS #70), and Saladin Ahmed. Scott will be at Cat and Saladin’s joint reading Friday at 7pm, and in the bar for plenty of the rest of the con. Feel free to say hello! 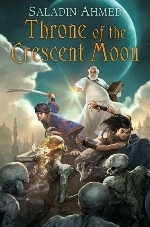 BCS author Saladin Ahmed, whose story “Where Virtue Lives” in BCS #15 debuted his character Doctor Adoulla Makhslood, has posted in his blog the opening chapter of his Doctor Adoulla novel, Throne of the Crescent Moon, which is coming out in hardcover from DAW this February. Check out that opening chapter here. Check out “Where Virtue Lives,” if you haven’t already. If you like them, look for Throne of the Crescent Moon in February. BCS #72 features Erin Hoffman’s story “Sightwolf”, which is set in same world as “Stormchaser, Stormshaper” in BCS #14 and her new novel, Sword of Fire and Sea. In conjunction with “Sightwolf” and the release of Sword of Fire and Sea last month, you can enter to win a signed copy of Sword of Fire and Sea that Ms. Hoffman will personally sign for the winner. To be eligible to win, just post a comment on “Sightwolf” in the comment thread on the BCS Forums. Good luck, and enjoy the story!